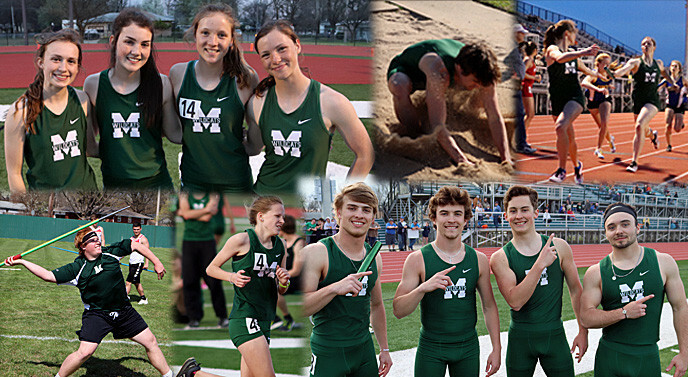 Coach Dale Landes and the Mulvane Track & Field team celebrated Senior Night last Friday in the last home meet of the season for Mulvane. The Cats finished the Senior night in fine fashion as the men's team once again took first place with 85 pts over Wellington (74 pts), Augusta (67 pts), and Circle (50 pts). The women's team once again took second place with 71.5 points behind Circle (103 pts) and over Wellington (47 pts) and Augusta (43.5. points). The men's team finished with 8 second place finishes, 1 third place finish, 9 fourth place finishes, and 2 fifth place finishes. The women's team finished with 7 second place finishes, 3 third place finish, 8 fourth place finishes, and 2 fifth place finishes. During the meet, the coaches and athletes took a moment to recognize the seniors Drew Ellis, Sahayb Hussein, Jeret Plummer, Ian Rex, Ryan Roderick, Zach Ruckman, Blake Scott, Johnathan Thorson, Jacob Walker, Braden Webb, Caden Webb, Eric Woods and their families. The Cats have lots of action left for this season as they at least 7 more meets before Regionals.